This colour YardPro Nova Portal Frame 360B Workshop is the ideal building solution if you are a serious home handyman. This ultimate man cave has additional floor space and enough head height so you can comfortably move around while keeping the things that you love in safe. Hi Lew, If you are after a shed, the regulaar height is 1.8m. 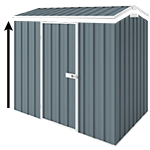 However, we have sheds that can have additional wall height to 2.3m only. If you are after a garage, we have some models that has a height with 2.4m. Hi, does this shed have gutters or is it possible to put them on? Hello, There's no gutter but it can be added as an extra.